The ACE supports the 31st MEU with assault transport, close air support and aviation command and control. 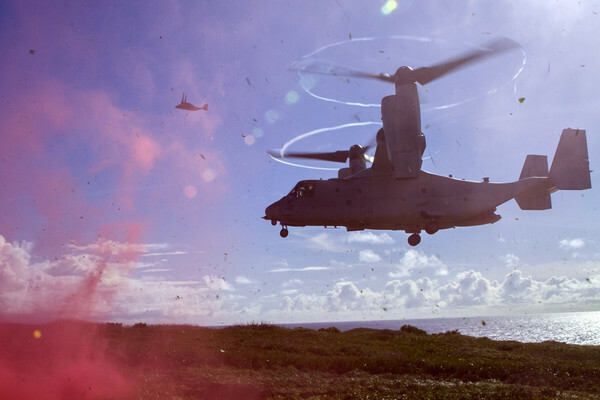 The ACE includes a reinforced MV-22B Osprey squadron and a detachment of F-35B Lightning IIs from Marine Fighter Attack Squadron 121 during the MEU’s regularly scheduled deployments, along with supporting detachments. The ACE for the 31st MEU rotates every 12 months. The last time VMM-262 (Rein.) was deployed with the 31st MEU, they supported exercises Valiant Shield in Guam, Amphibious Landing Exercise in the Philippines and Cobra Gold in the Kingdom of Thailand. They also received the 2017 Pete Ross award from the Marine Corps Aviation Association for their aviation safety record in 2016. The 31st MEU is the only continuously forward-deployed MEU and is capable of accomplishing a wide-variety of military operations including humanitarian assistance and disaster relief, regional security and non-combatant evacuation.